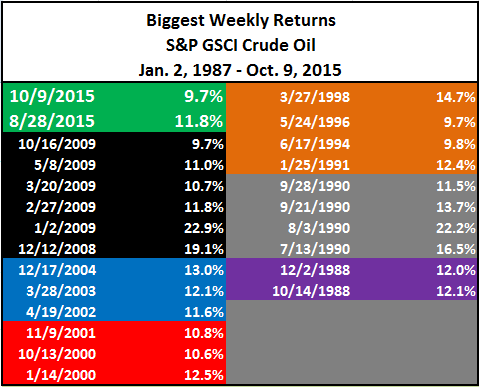 Last week, the S&P GSCI Crude Oil gained 9.7% in one of its best weeks (24/1501) in history since 1987. It was the second best week in 2015, following its gain of 11.8% in the last week of Aug. Historically, with the exception of the bottom in 1988, there have been greater than 2 weeks of spikes bigger than last week’s before a bottom was hit. So maybe oil hasn’t hit a bottom yet by this metric, but it wouldn’t be completely unprecedented or unreasonable. Source: International Energy Agency – Oil Market Report, Oct. 2015. 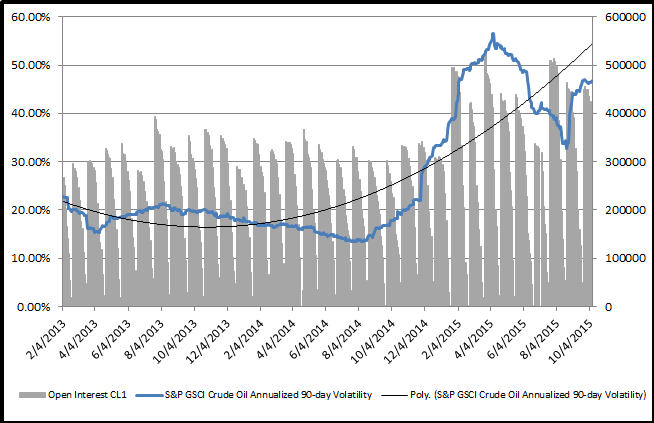 Last, one indicator that has historically crashed at the peak of volatility and oil bottom is open interest. It fell briefly but quickly elevated to its relatively high current level. Despite this, there are calls on oil that call a bottom in this quarter or next, and quote a range of $75 by the end of 2017. 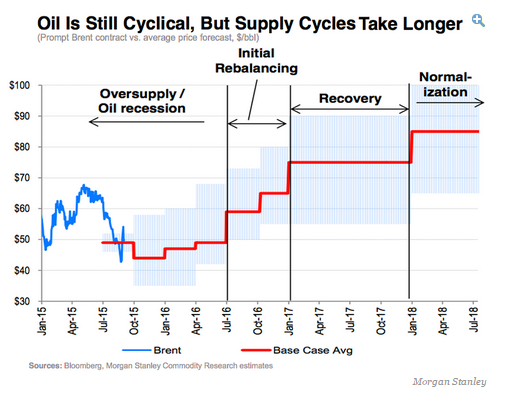 PIRA energy group says the current market slump is setting the stage for prices to surge to $75 within two years, and below is a chart from Morgan Stanley of their oil market outlook, also showing oil in the $75 range for 2017. So, what is the right call? S&P Dow Jones Indices isn’t in the business of making prediction but the indices are historical storytellers. 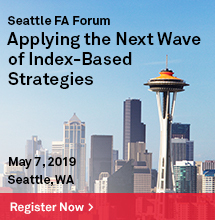 A new family of indices, the S&P 500 Bond indices, has recently been introduced to help analyze companies and industries inside the S&P 500. 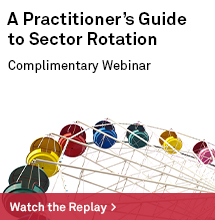 Some of the sectors have significantly more equity, like technology, but some have more debt like utilities. Energy is pretty evenly matched, holding similar weights in each the stock and bond composite. Let’s take a look at the performance relationships between the stocks and the bonds by using the S&P 500 Energy Total Return and the S&P 500 Energy Corporate Bond Index Total Return to see how the market views the equity risk premium, or in other words how strongly the market believes oil stocks will rise (equity performance) or fall (bond performance.) 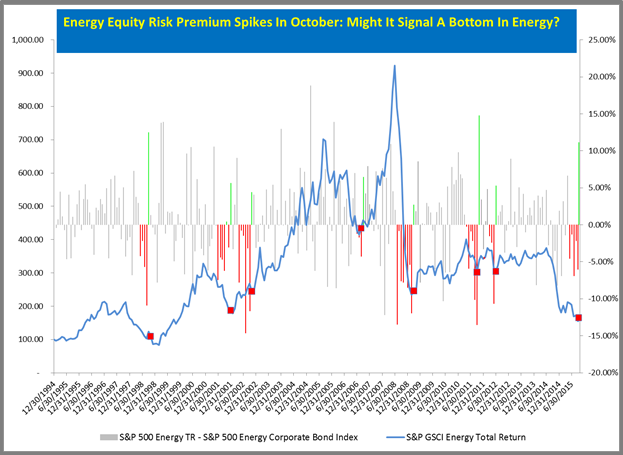 Historically the beta of the S&P GSCI Energy Excess Return (total return – T-bill) to energy stock alpha (S&P 500 Energy – S&P 500) is 1.05 and to energy bond alpha (S&P 500 Energy Corporate Bond Index – T-bill) s is 0.71, with respective correlations of 0.52 and 0.13. Below is a chart of the historical S&P GSCI Energy TR index levels versus the equity risk premium as measured by the S&P 500 Energy Total Return monthly minus the S&P 500 Energy Corporate Bond Index Total Return monthly. Notice the recent spike in the equity risk premium that has developed in Oct. The magnitude of the equity risk premium and spread change from a discount to a premium is the biggest since Oct. 2011, and the magnitude is the 8th largest on record with the 5th biggest swing. Maybe oil is near a bottom, or maybe just that’s the market sentiment. 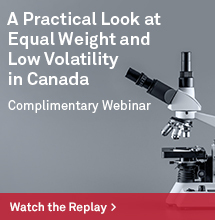 To find out what the experts think visit the replay of the S&P Dow Jones Indices 9th Annual Commodities Seminar. 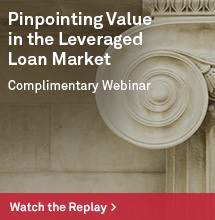 To find out more about the S&P Dow Jones Bond Indices, click here, or click on one of these links if you’d rather watch a short video about the basics of the bond index, or about what is inside the broad bond index or about the bond sectors. Please let us know if you have any questions.